INK studio is honored to present Bingyi’s second solo exhibition at our Beijing gallery Bingyi: Impossible Landscapes. An artist, architectural designer, curator, cultural critic, and social activist, Bingyi (b. 1975, Beijing) has developed a multi-faceted practice that encompasses land and environmental art, site-specific architectural installation, musical and literary composition, ink painting, performance art, and filmmaking. Adopting a non-anthropocentric perspective and channeling nature’s creative agency, her work is centrally concerned with the themes of ecology, ruins, rebirth, and poetic imagination. After pursuing university-level studies in biomedical and electronic engineering in the United States, Bingyi earned a Ph.D. in Art History and Archeology from Yale University in 2005 with a dissertation on the art of the Han Dynasty. The last three years have been an intensely productive and transformative period for the artist. During this time, Bingyi has written, directed and edited Ruins—a trilogy of art films on the destruction of the hutongs in Beijing—composed a film script for Ruins in the form of a 1600-line epic poem in Han rhapsody form which was published in Huacheng—China’s leading journal for experimental literature—authored a new theoretical treatise on the landscape painting discourse in China, Shanshuilun, completed Emei Waterfall, the fifth of her massive land-and-weather earth works at sacred mountain sites in China, and created two entirely new series of ink paintings entitled respectively the Archaeology of Waves and Impossible Landscapes. For her latest massive land-and-weather earthwork, Emei Waterfall, Bingyi’s moved her studio during the summer of 2018 to this sacred Buddhist mountain site in Sichuan Province. After studying the topology, temperature, humidity, rainfall and convection currents of various locations she selected two sites. One site, a dry cascade, she chose to investigate the movement of water. The other site, a mountain road, she used to engage the local terrain. In her first performance, she covered the dry cascade with roughly two-hundred meters of white canvas and used ink diluted with alcohol to record the path of water down the natural, vertical topology. 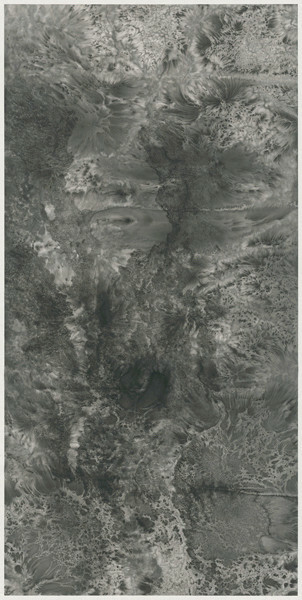 In her second performance, Bingyi covered the mountain road with massive, bespoke sheets of xuan paper and then, over the course of several days, applied layers of ink, water, and an undisclosed third material.Factors such as gravity, wind direction, evaporation, humidity, air pressure, condensation, rain, sunlight, and the topography of the land together shaped the interaction of these natural materials. In her latest series of classical landscapes entitled Impossible Landscapes, Bingyi employs traditional brush and ink on silk or xuan paper. Bingyi explores the underlying paradoxes and dialectics that animate her interpretation of landscape painting such as the relationship between painting a painting, viewing a painting and living; landscape as subjective projection versus objective reality; landscape as metaphor both for nature and for culture; painting as both creation and death, self-awareness or absorption into the infinite, observing the macrocosm in the microcosm and the microcosm in the macrocosm, aesthetic experience as philosophical understanding, intimacy versus alienation as the basis for knowledge. In her Shanshuilun or Landscape Treatise these ideas take the form of theoretical writings. In a series of nine handscrolls entitled Lianchao or “The Lotus Dynasty,”however, Bingyi’s theories are given literary and painterly form. The Lotus Dynasty is a figment of Bingyi’s imagination—a utopian society that exists in a slip of time after the Southern Song, where wars are fought not with weapons but with poetry, where rivers flow with fragrance instead of water and where the capital city contains no palace buildings but only mountains and streams filled with music. Each scroll transforms a poetic image from her fictional utopia—a gnarled prunus made up of the organs of the artist, a scholars rock in the form of a lingo jade, a mountain forest filled with music and fragrance—into a painted image, an Impossible Landscape. Assuming the voice of the emperor, a philosopher, a poet and a historian in her counterfactual utopia, Bingyi authored all of the texts—from the emperor’s edicts to the Kuangjing or “Sutra of Madness”—that are inscribed on the paintings. Painting for Bingyi is thus a unity of visual and literary arts. As in her Fairies series of poetic subjects painted in the fan format, Bingyi’s Lotus Dynasty handscrolls employ her fine-line xieyi or “calligraphically expressive” brushwork drawn from her dailyxiaokai or “small regular” sutra writing practice. Through her hypnotic, obsessive endurance and execution both painstaking and nuanced, one senses the original power of poetry, painting and calligraphy together to limn a utopian reality from the tip of a brush. Impossible Landscapes concludes with a monumental tour-de-force—a five meter horizontal scroll entitled Yichen Qianshan or “A Thousand Mountains in One Particle of Dust.” Comparable in scale and scope to to Bingyi’s monumental handscroll Apocalypse from 2015, Bingyi visually unpacks the “impossible” notion of the infinitude of all things and beings—wanwu—contained within a single, particular existence—a speck of dust.